Health care workers and other front-line responders are being vaccinated. 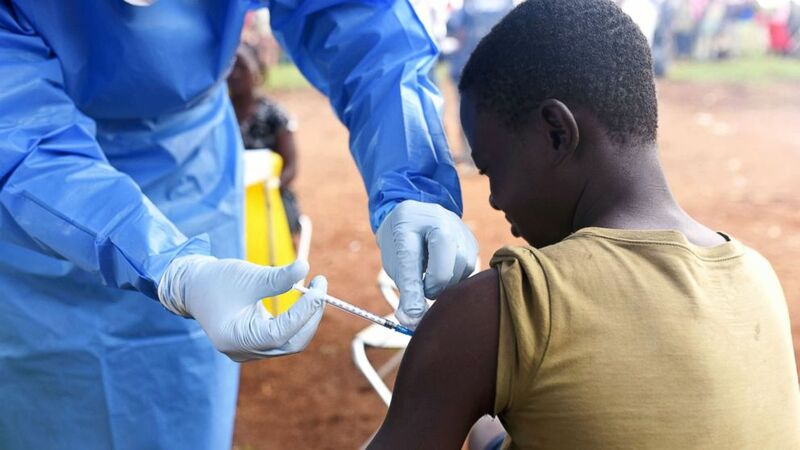 South Sudan on Monday began vaccinating its health workers and other front-line responders against Ebola amid fears the deadly disease could spread across the border from the Democratic Republic of the Congo, health officials said. The Democratic Republic of the Congo is battling one of the world's worst Ebola outbreaks. The two provinces in the country where cases have been reported share porous borders with South Sudan as well as Uganda and Rwanda, raising the risk of regional spread. Neighboring nations have not reported any cases but "preparedness is crucial," according to a press release from the World Health Organization, the global health arm of the United Nations. (Andreea Campeanu/WHO) South Sudan begins vaccinating health workers and other front-line responders against Ebola virus disease, Jan. 28, 2019. South Sudan received 2,160 doses of the yet-to-be-licensed Ebola vaccine, which was developed by American pharmaceutical company Merck and protects against the Zaire strain of the virus that's currently affecting the Democratic Republic of the Congo. With support from the WHO and other international partners, South Sudan's health ministry launched the vaccination campaign on Monday in "high-risk areas" near the southwest border, including the country's capital and largest city, Juba. "It is absolutely vital that we are prepared for any potential case of Ebola spreading beyond the Democratic Republic of the Congo," Dr. Matshidiso Moeti, WHO regional director for Africa, said in a statement. "WHO is investing a huge amount of resources into preventing Ebola from spreading outside DRC and helping governments ramp up their readiness to respond should any country have a positive case of Ebola." (Olivia Acland/Reuters, FILE ) A Congolese health worker administers Ebola vaccine to a boy who had contact with an Ebola sufferer in the village of Mangina in North Kivu province of the Democratic Republic of Congo, Aug. 18, 2018. Since the outbreak was declared in the Democratic Republic of the Congo on Aug. 1, a total of 736 people have reported symptoms of hemorrhagic fever in the country's northeastern provinces of North Kivu and Ituri. Among those cases, 682 have tested positive for Ebola virus disease, which causes an often-fatal type of hemorrhagic fever, according to Monday night's bulletin from the country's health ministry. The growing outbreak has a case fatality rate of around 62 percent. There have been 459 deaths thus far, including 405 people who died from confirmed cases of Ebola. The other deaths are from probable cases, the ministry said. This is the 10th Ebola outbreak in the Democratic Republic of the Congo and the most severe that the Central African nation has seen since 1976, the year scientists first identified the virus near the eponymous Ebola River. 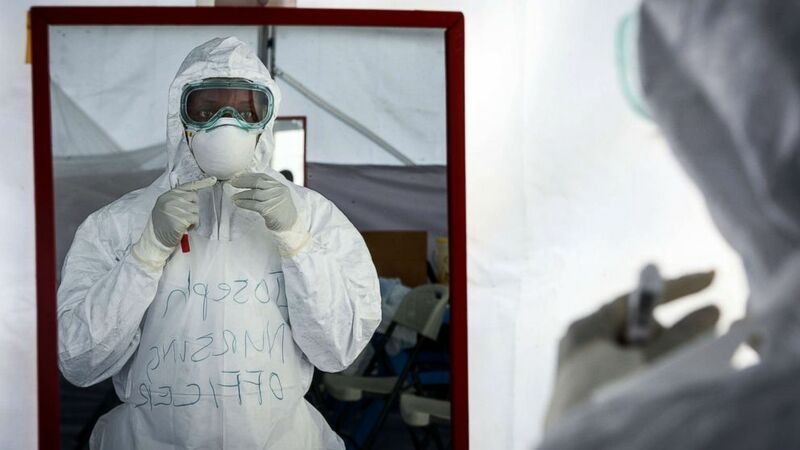 (Isaac Kasamani/AFP/Getty Images, FILE) A member of the medical staff of the Ebola Treatment Unit (ETU) checks her Personal Protective Equipment (PPE) in front of the mirror during a weekly rehearsal at the Bwera General Hospital in Bwera, western Uganda, Dec. 12, 2018. The second largest Ebola outbreak in Africa has started in Democratic Republic of Congo causing 298 deaths since August 2018, according to the World Health Organization. More than 69,000 people have been vaccinated in the outbreak zone since Aug. 8, more than 21,000 of whom are health workers and other front-line responders, according to the country's health ministry. 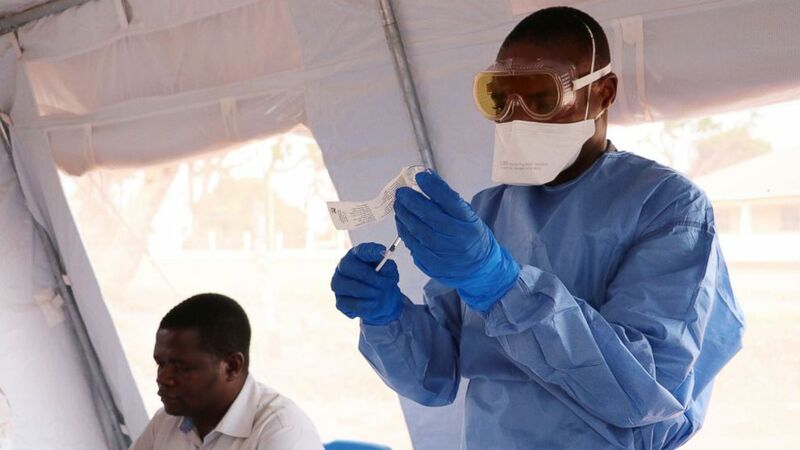 The WHO has warned that although the risk of a global spread remains low, the risk of the outbreak spreading to other provinces in the Democratic Republic of the Congo as well as to neighboring nations remains "very high." Uganda started vaccinating its health workers and front-line responders against Ebola in November. Rwanda also plans to do the same. Though not yet commercially licensed, the rVSV-ZEBOV vaccine is being provided under what is known as "compassionate use" in the ongoing outbreak after it proved effective against the Democratic Republic of the Congo's previous outbreak that lasted from May to July, according to the WHO.